More than 70 authors, several of them from the IUFRO community, contributed to the sourcebook that is targeted at project managers, academic institutions, NGOs, students and researchers, among others, with a background in remote sensing. Deforestation remains high in the world’s tropical forests, largely because of dependence on land-based economic activities such as palm oil production or small scale slash and burn farming and also from continuing pressure from industrial crops. “Project managers and policy makers who are not experts in remote sensing will find background information on the policy context to which the remote sensing datasets and techniques aim to provide support,” said Dr. Mora. “However, the implementation and-or adaptation of the methods presented will require specialized knowledge. 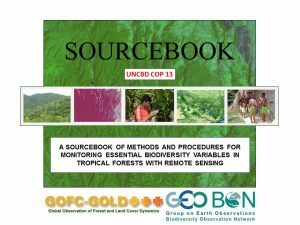 “That being said, the sourcebook provides non-specialists with an opportunity to understand how such technology can support biodiversity conservation policies and help target planning,” he added. This publication will allow forest managers and other interested stakeholders to find information on how remote sensing techniques can support the development of relevant essential biodiversity variables (EBVs) for tropical forest management. EBVs are proposed by the GEO BON (Group on Earth Observations Biodiversity Observation Network) for the study, reporting and management of biodiversity change. The EBVs are important because they will provide global-scale, consistent core information to monitor biodiversity trends and thus allow more targeted actions to halt biodiversity loss and achieve the 2020 targets on the UN Convention on Biodiversity (UNCBD). Among subjects discussed in the book are general steps for relevant EBV production, including the type of datasets and main processing steps; how synergies between biodiversity monitoring and carbon emission mitigation can be made both at institutional and technical levels; and how local communities can be integrated in monitoring activities. For countries newly engaged in biodiversity loss mitigation there is a chapter on existing regional biodiversity networks in the pan-tropical region and guidelines on how to develop new networks. The major challenge in developing the sourcebook was “identifying contributors with both the expertise and time to undertake the initiative on a voluntary basis, and then coordinating their efforts in a way that allowed the development and review of the chapters in a timely manner” said Dr. Sandra Luque, Research Director at IRSTEA (National Research Institute of Science and Technology for Environment and Agriculture), France, and Deputy Coordinator of IUFRO Division 8 Forest Environment. She worked with Dr. Mora pulling the project together.